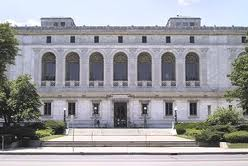 This morning, DWW president Diana Dinverno and I are heading out to the Detroit Public Library where the Detroit Working Writers collection is housed. I’ve never been to the DPL so this is exciting in itself. Every writer loves a library! Add to that the fact that we may be seeing some really old documents and other items (DWW was started in 1900 and has been in operation ever since) and I feel a little bit like I’m on an archeology dig. Why are we doing this? Because September 15, 2012, DWW is holding a conference at the Clinton-Macomb Public Library (main branch) and we would like to take advantage of their display cabinets to show off our history to our newest members and the rest of our local community who don’t know us. I’m so happy even the rain can’t bring me down. There is one thing I’m not happy about: I’m not going to get the chance to do much writing for the next few days. It’s back to snatching a few morning pages here and there. My son and his wife are visiting from Seattle, my parents are moving to Florida, and Al and I are hosting the family here on Saturday. I need to vacuum and do laundry and grocery shop and make potato salad…all that stuff I usually put off because I’m writing. There are times when it’s okay not to write. Special family times are one of them. Another is taking a day off from the keyboard to explore a library. Working on a project that will highlight a long history of authors and inspire today’s hopeful writers is a third reason. I don’t feel guilty taking time from the WIP, but I’m still going to miss it. It’s a beautiful building, Cindy… enjoy your visit there. And I’m right where you are, not writing for a few days after a marathon month of productivity. Nate and Andrea are coming home (starting tonight) for the big family shower this weekend. I know you always find, I as do, that these breaks are good for the soul, even if you miss the writing. I am always sharper and my work is crisper when I’ve taken time off. Enjoy YOUR time with the family — I bet you are excited! Can’t wait to see what you bring back! There is so much DWW history that should be used in our promo materials and be on our website. Hey Cindy, I forgot that perk. It’s true. Time off gives the writing (when you get back to it) a push & a spark:) Enjoy your family too! Summer is just too short.